When preparing your site you need to keep in mind that, like any other structure, your concrete pad will last longer if it has a good foundation under it. Pouring concrete on non-compacted material and/or frozen ground puts your concrete pad at risk. If you prepare a pad of approximately 2" to 4" of base rock you’ll provide your concrete with a great foundation to last for years and years. We rent premium hand trowels, bull floats and jitter bugs to help you get the best results possible. HOW FAR CAN YOU HAUL CONCRETE? 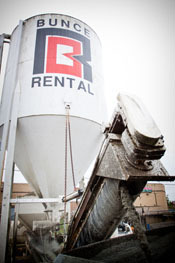 Typically, Bunce Rental concrete in a regular tub trailer can be safely hauled twenty-five to thirty minutes before dumping. 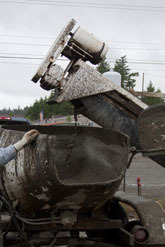 If you’re worried about the settling of the aggregate or need a longer travel time to the job site, Bunce Rental has concrete mixing trailers available which mix the concrete continuously until dumped at your site. When loaded with concrete Bunce Rental concrete trailers are heavy! Getting your vehicle to safely stop can be a big problem. We will not allow anything less than a 3/4 ton pick up WITH a class 3 hitch to tow more than 1/2 of a yard of concrete. We reserve the right to inspect your hitch/towing system and make the decision whether we will allow you to tow our trailers with your vehicle. Please discuss this with us either before you come see us or when you arrive. If you have any questions, please call and ask us. We’ll be happy to help you! Our concrete contains Portland Cement that contains hazardous chemicals which can cause physical harm to persons who improperly work with the concrete. CLICK HERE to learn more about other necessary precautions one should take when working with our concrete products.